The idol scene appears to be going through a particularly active period at the moment with both new groups and old groups jostling for position. It’s a situation that’s also been accentuated by the emergent ‘Kawaiicore’ scene that’s seen the rise of outfits such as LADYBABY as well as the absurdly successful BABYMETAL. A lot of this activity is also reflective of the strong underground idol scene that previously gave us the likes of Brand-New Idol Society a few years back (and whose legacy is still going strong in the form of BiSH). So what’s happening with outfits that plough the middle ground between the underground scene and the more commercial operations? In that particular niche we find the likes of Shiritsu Ebisu Chugaku, who are often referred to as the “little sister” group to Momoiro Clover Z (they’re both under the management of the Stardust Promotion agency). Originally launched as a 4-piece outfit in 2009, the Shiritsu Ebisu Chugaku concept was as a group of elementary/middle school students who had very rough singing and dancing skills. Hence the outfit’s name, which translates as “Ebisu Private Junior High School” – a fictional school (based in the very real Ebisu area of Tokyo). The group’s name is often shortened to ‘Ebichu’ which is a typical example of Japanese wordplay with a phrase that can mean “in a shrimp”. As an outfit, Ebichu has since expanded to its current 8-piece ensemble having gone through a few lineup changes since its inception (Rika Mayama being the sole original member of the outfit). Beginning their recording career with a series of indie single releases, they switched up to Defstar Records in 2011 with the release of ‘Karikeiyaku no Cinderella’ a particularly energetic pop tune which managed a sensible No. 2 position on the Oricon Daily Singles Chart. Ebichu’s debut album Chūnin arrived in 2013 and managed to present a selection of material that elevated them above the usual idol fare. The natural voices of the 8 members are accentuated across a number of songs that combine melody, pop sensibility and, perhaps most important of all, fun. Songs such as ‘Ume’ certainly have the kinetic energy that wouldn’t look out of place with Momoclo singing it. But with 2015’s Kinpachi album, Ebichu appeared to have raised the bar even further. As an album, it’s packed with solid pop tunes from the euphoric ‘Kinpachi Dance Music’ , the rock-infused ‘Butterfly Effect’ and the raw dance-pop of ‘Chichinpui’. Now their latest album Anarchy arrives and the question is whether or not our shrimp-themed pals can keep that consistent quality going. There’s certainly an attempt to hold onto that raw rock component on much of the material on Anarchy – summed up perfectly on powerful lead single ‘Zette Anarchy’ whose ‘punk idol’ aesthetic could have been crafted from the BiS songbook. The simple pop appeal of ‘Nikibi’ marks one of the album’s highlights. So it’s a surprise perhaps to learn that the tune was composed for a Clearasil ad. As with any other commercial outfit (Perfume and KPP spring to mind). Ebichu work with companies to create songs that help promote a product, as well as the group themselves. While these MC collaborations can often consist of flavourless pop tunes, there’s a charm to ‘Nikibi’ which discards the rock trappings evident on the rest of the album. On that basis, it’s a gear change that will either win listeners over – or confuse the hell out of them. But if there’s a real ‘Marmite moment’ on Anarchy then it’s ‘Ponpara Pecoruna Papiyotta’. This slice of bombastic rock opera is performed by 5572320 (actually Ebichu in another guise). What marks this track out from the rest of the album however (aside from how bonkers it sounds) is the production credits. The song was composed by the legendary Yoko Kanno herself. Plus, the performers during the recording include KenKen (bass player with rock outfit RIZE) and Hideki Aoyama – better known as the drummer in Kami Band, who of course perform with the mighty BABYMETAL. As with ‘Nikibi’, it appears that the creation of 5572320 is actually rooted in a commercial tie-in, in this case with a long established biscuit brand (hence the pointed biscuit visuals in the suitably bizarre video). Ebichu’s whole school-themed approach brings to mind the likes of Sakura Gakuin (who, regular viewers will be aware, actually form the parent group of BABYMETAL). There’s a few tracks on Anarchy that bring to mind the particular style of Sakura Gakuin, such as the harmonic joy that’s ‘Ebichushussekibangounouta Sononi’ and the wota-friendly singalong that forms ‘Natyumeroandebu’. Elsewhere, ‘Mission Survivor’ opts for a much more electronic effort with crunchy synths and a few obligatory wota callouts. Ebichu return to a more classic rock approach for the more mid tempo ‘Onegai Jesus’. ‘Zenryoku Runner’, meanwhile, appears to offer a nod to Supercell with its piano licks and rapidfire percussion. But the album still presents a few moments that sound like they could be easily interchanged with Momoclo, such as the operatic trills of ‘Superhero’. The album’s closing track ‘Sanmaime No Toughgaki’ delivers yet another gear change with a number that’s got more of an EDM feel to it than the rest of the album. On that basis, it’s an odd choice to close out Anarchy, but there we go. 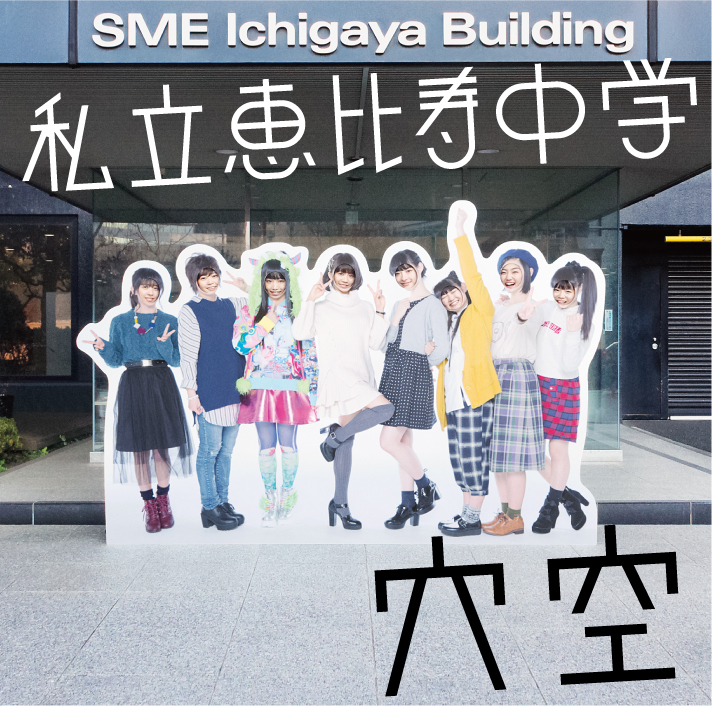 Groups such as Shiritsu Ebisu Chugaku demonstrate how diverse the current idol scene is. They also reflect on the legacy of a healthy underground movement that present new and challenging ideas on a regular basis. This further reveals the absurdity of critics who view idol music as a concept that’s outstayed its welcome (usually with a reductionist argument that suggests AKB48 are the only idol outfit on the planet). In fact the consistent backlash on idols reveals less of a genuine criticism at times and more of an envious position that a popular movement (featuring mainly young women) is out of the control or understanding of people (mainly men) who would like to see themselves as gatekeepers of the Japanese music industry. As an album, Anarchy appears to lack the consistency of its predecessor Kinpachi, but also reveals an outfit that are keen to push the envelope and experiment with new ideas. On that basis, this album offers up a few challenges but also has enough accessible pop moments to entertain the ears of even the most jaded listener. Anarchy is available now on iTunes.